Great App, this is the app I use most. I have 2 suggestions to make. When I tap on"mark all read" it could be nice to automatically load the next feed. On the iPad, it could be nice to highlight the current feed on le left pane, to quickly see what feed is loaded in the right pane. Thanks again for a great app! I now use your app many times a day (have switched from Reeder). The most important missing feature that I would really like to see in the near future is a very simple one: When viewing an article, there is a menu button in the bottom right corner. This menu contains (among others) the actions "share on twitter" and "share on facebook". Please add the actions "copy article url to clipboard" (must-have) and "open in chrome" (nice-to-have). Many thanks in advance for your consideration to implement this feature in the next release of the app. Of course I have several other suggestions for improving the UI of the app. Please let me know if you are interested in more. In the preferences, there is a non-localized French string of "Boutons d'action ...", which is on a preference that cant be toggled. Also, is there a way to get swiping to change articles like the android app? or is that what that change does? Well, in fact when you tap "Mark all read" the app reload the feeds because it only displays the first 200 (depending on the API). So the next 200 unread feeds are loaded (if needed). Ok, I'll take a look at that idea. Last edited by Tiberius on 21 Sep 2014, 13:33, edited 1 time in total. You're right, on iPhone the settings are completely messed up. I'll fix that in the next release. This option is for action buttons which appears when you swipe a cell in the feed list. Unfortunately, this seems to be broken with iOS 8. Not sure about your question. When reading an article, you can swipe left/right to read the next/previous one, is this what you meant ? Can you please add "mark above articles as read" or "Automatically mark read when scroll down" features into tiny Reader? It is really helpful when people like me who put a lot of feeds in one folder. The current "Mark them all" feature is inconvenient because I always cannot read them all at one time. Really really appreciated! And really nice work for this app! I've updated my App for iOS 8 compatibility, iPhone 6/6+ and some bug fixes. I'm using the new Apple TestFlight for testing apps, so if you want to test it on an iOS 8 device, just send me a PM with your email. 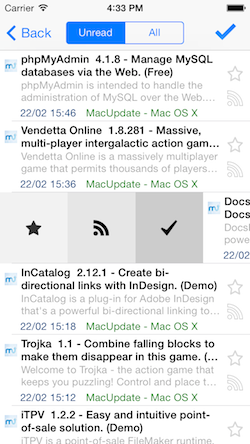 You'll receive an invitation to download TestFlight (if not yet installed), then tiny Reader RSS 1.3.1 for iOS. yet again may I say this is a great fast app and works perfectly. I have just one possible suggestion, to have LABELS at the top of the feed list just like the web version, or give the option to do so. Did you mean this ? The Labels category which is currently ordered in alphabetical order on the app. This is when labels are assigned via filters to feeds for highlighting etc.